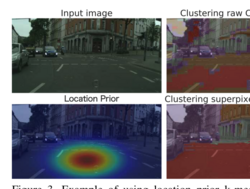 The IU Computer Vision Lab investigates and develops advanced statistical and machine learning techniques for automatically analyzing, understanding, and organizing visual information. Our applications include recognizing objects in consumer images, analyzing human activity in video, discovering patterns in large scientific datasets, reconstructing 3-d models of world landmarks, and even studying visual attention in toddlers. Apr 9, 2019: Congratulations to Katie Spoon for an IU Provost's Award for Outstanding Undergraduate Research, an NCWIT Award, and an NSF GRF! Check out her research project. Jan 25, 2019: Congratulations to Dr. Chenyou Fan on a successful PhD defense! 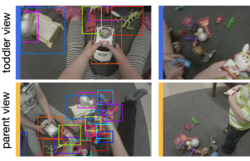 Dec 6, 2018: Check out our NeurIPS 2018 paper on toddler-inspired visual object learning. Oct 29, 2018: Thanks to all who participated in OurCS (aka HelloResearch) this weekend; we had a great time working with such talented students! More info in our SIGCSE 2019 paper. Sep 12, 2018: We're looking for new faculty in Machine Learning, especially those who are broadly interested in potential connections with human learning. Consider applying! Sep 1, 2018: A trio of new papers on egocentric cameras: predicting gaze (BMVC), segmenting and identifying people and camera wearers (ECCV), and estimating head motion (ICMI). Aug 13, 2018: Welcome to new postdoc Md Alimoor Reza! Jul 19, 2018: Congratulations Dr. Jangwon Lee for successfully defending his Ph.D. thesis! May 30, 2018: New contract with Purdue and the Indiana Innovation Institute on computer vision to help protect the microelectronics supply chain. Apr 3, 2018: Congratulations to lab intern Abraham Oliver on winning best 12th grade project at the Indiana State Science Fair! Mar 29, 2018: Congratulations to Dr. Tian (Linger) Xu on a successful PhD defense! Feb 15, 2018: Co-organizing Third ICWSM workshop on The Social Web for Environmental and Ecological Monitoring. Please consider submitting! Jan 24, 2018: New contract from NASA on quantifying lymphatic function using computer vision, with Dawn Kernagis (IHMC) and Eva Sevick (TMC). Dec 5, 2017: Co-organizing second CVPR workshop on The Bright and Dark Sides of Computer Vision: Challenges and Opportunities for Privacy and Security. Consider submitting a paper! Nov 1, 2017: We have openings for postdoc researchers -- please contact David for more information! 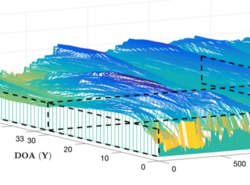 Oct 20, 2017: Two fun remote sensing papers: 3d reconstruction of ice bed surfaces (at ICIP) and combining ground and satellite images to make maps (at ICCV). Sep 1, 2017: Thanks to Google for sponsoring a new project investigating the limits of current computer vision technology. Aug 23, 2017: IU is hiring faculty in the general area of Machine and Human Learning. Consider applying! Jul 22, 2017: Check out our CVPR paper on associating wearable (egocentric) video with third-person video! Jul 21, 2018: Congratulations to Jangwon Lee and Michael Ryoo for winning Best Paper at the CVPR Deep Learning for Robotic Vision Workshop. Jun 26, 2017: How has visual design on the web changed over time? Two new papers use expert surveys and computer vision to help find out. Jun 10, 2017: How can developmental psychology inform computer vision, and vice-versa? Check out the talks from our Workshop on Egocentric Vision: From Science to Real-World Applications. May 20, 2017: I'm very honored for the IU Trustees Teaching Award. But the credit goes to great IU students who make teaching fun -- thanks everyone! Apr 28, 2017: Congratulations to Dr. Jeff Johnson on a successful proposal defense! Mar 20, 2017: Co-organizing WebSci workshop on The Social Web for Environmental and Ecological Monitoring. Deadline is May 1. Please consider submitting! Feb 15, 2017: Co-organizing CVPR workshop on The Bright and Dark Sides of Computer Vision: Challenges and Opportunities for Privacy and Security. Consider submitting a paper or abstract! Jan 11, 2017: Very excited to lead the CS part of a new $2.5 million award to study interdisciplinary connections between human and machine learning! Dec 15, 2016: Co-editing special issue on Egocentric Vision and Lifelogging Tools in the Journal of Visual Communication and Image Representation. Please consider submitting a manuscript! 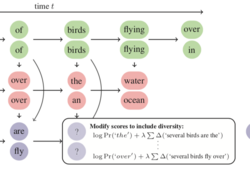 Dec 7, 2016: Check out our NIPS 2016 paper on training diverse networks using multiple choice learning. Oct 15, 2016: Robert Pless and I are CVPR 2017 tutorial co-chairs. Please consider submitting a proposal! Oct 8, 2016: Could wearable cameras narrate our lives? Our "DeepDiary" paper at ECCV EPIC is a first step. Aug 22, 2016: Best paper award at ICDL-Epirob 2016 on wearable cameras to study infant word learning, with Sven Bambach and Profs. Linda Smith and Chen Yu. Aug 10, 2016: What may machine learning reveal about infant learning? Check out ourCogSci 2016 paper! Aug 22, 2016: Congratulations to Dr. Sven Bambach on successfully defending his dissertation to earn two PhDs, in Computer Science and Cognitive Science! Jul 30, 2016: We've moved! Come visit our new lab (and my new office) at 611 N Park Ave (one block west of Informatics West). Jul 20, 2016: Congratulations to Dr. Stefan Lee on his dissertation defense! Jul 13, 2016: New contract to collaborate with NSWC Crane on analyzing images of microelectronic devices! Jul 1, 2016: Promoted to Associate Professor (with tenure). Jun 27, 2016: Interested in improving diversity of your deep networks? Check out this talk by my student Stefan Lee at a CVPR tutorial. Jun 12, 2016: Check out our book chapter on landmark recognition in a new book on geolocalization. May 26, 2016: Grant from the IU Social Science Research Commons to investigate applications of computer vision to geography, with Prof. Tom Evans. Thanks SSRC!! Mar 29, 2016: Congratulations to senior Ben Newman on winning an NSF Graduate Research Fellowship! Feb 12, 2016: Our new CHI 2016 paper on detecting computer screens to enhance lifelogger privacy is a CHI best paper honorable mention! Jan 15, 2016: I'm co-organizing an International Workshop on the Social Web for Environmental and Ecological Monitoring at ICWSM 2016. Short and long papers due Feb 20. Consider submitting! Dec 1, 2015: Check out our paper on mining Flickr data for monitoring impact on protected natural areas in Ecological Applications. 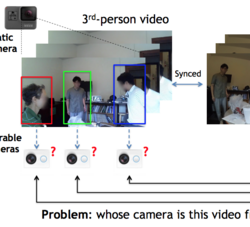 Sept 15, 2015: New ICCV 2015 paper, website, and dataset on hand recognition in first person video. Check out the video spotlight! Aug 1, 2015: Welcome to new IU faculty member Prof. Michael Ryoo! Check out his interesting work on vision and robotics. May 26, 2015: Congratulations Dr. Mohammed Korayem on a successful dissertation defense! 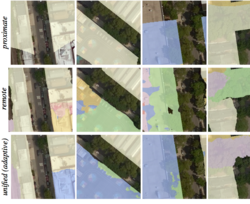 Apr 20, 2015: ICCP paper on mining architectural elements in Google Street View. Check out the demo! 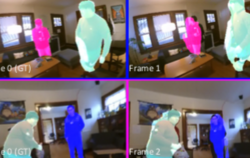 Dec 18, 2014: New NSF grant to study privacy in first-person cameras, with Apu Kapadia and Denise Anthony. Check out the video! Sep 30, 2014: An article in Fast Company about our first-person camera privacy Ubicomp paper. Sep 8, 2014: Looking for a faculty job? Our school is hiring in Interactive and Intelligent Systems (as well as several other areas). Aug 22, 2014: Congratulations Dr. Haipeng Zhang on a successful dissertation defense! Aug 6, 2014: Check out our redesigned lab website, including a nice new overview of our projects! Jul 21, 2014: Congratulations Dr. Kun Duan on a successful dissertation defense! 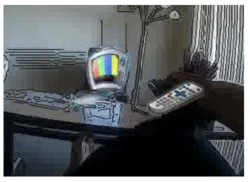 June 22, 2011: Our paper on 3d reconstruction won runner-up best paper at CVPR 2011! 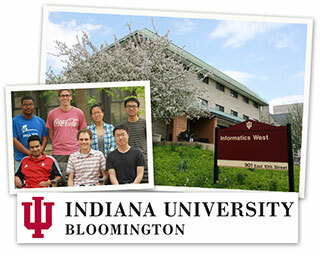 Aug 1, 2010: Joining the faculty of Indiana University School of Informatics and Computing!